It's been nearly a century since airships floated by the Empire State Building. But now that the aluminum airship of the future is here and almost ready to carry passengers, it's high time that we took a look back to those few decades when majestic zeppelins seemed like the future of travel. Below is a bountiful image selection from the first half of the 20th Century—but don't hesitate to add your own favorite photos in the discussion below! "La France," a French Army airship, was the first fully controllable airship, designed by Captain Charles Renard and Lieutenant Arthur Krebs, seen here in 1884. "La Ville de Paris," a very early dirigible balloon, built by Henri Deutsch, a French petroleum businessman, circa 1904. July 4, 1908: The most famous of all airships, the Zeppelin, invented by Count Ferdinand von Zeppelin (1838 - 1917). This dirigible rigid airship first flew on July 2, 1900. German military officer Count Ferdinand Zeppelin, with the Countess Zeppelin. A German zeppelin dirigible flies over Balkan terrain during World War I, 1910s. To boost the sagging morale of their troops, the Germans sent these vulnerable airships for publicity flights. They were also used for reconnaissance missions. September, 1912: Military personnel prepare to take off in an army airship. Group of men board an airship sometime between 1915 and 1925. A German zeppelin caught in the searchlights during a bombing raid in 1916. 1917: A British airship attached to its mooring. February 1919: The frame of a zeppelin under construction at Short Brothers Works in Belfast. Two girls who worked at Short Brothers Works building zepplins, in 1919. The interior of a zeppelin gas bag being patched at Short Brothers Works in 1919. March 1919: The British airship R33 in its hangar as it prepares for its first ever flight at an aerodrome in Barlow, Yorkshire. August 1919: Model of the British R-34 airship at the Woolwich carnival. The R-34 made the first airship crossing of the Atlantic in July. February 1923: A helium-filled US Navy dirigible, the "Los Angeles," formerly the ZR3, was built by the Germans as part of their war reparations. Circa 1925: The lounge of the British airship R101. These passenger quarters were the most spacious ever provided in an airship. September 1928: The Graf Zeppelin (D-LZ 127, i.e Deutsches Luftschiff Zeppelin #127) under construction. A sleeping cabin and the kitchen area on the Graf Zeppelin (1928). German boys with a toy Zeppelin (1928). 1929: The British airship R-100 flies through a thick layer of clouds. She was scrapped after the crash of her sister ship, the R-101, in 1930. October 1929: The airship R101 flying over the British town of Bedford on its first flight. October 9th, 1929: Passengers playing cards and watching the view over Yorkshire on the verandah aboard R100. A maid prepares a dish in the kitchen of airship R 100, at Howden, Yorkshire. Passengers surveying the scene from the verandah deck of the British R100 Airship, built to compete with the great ocean liners of the day. Members of the Dominion Legislative Conference dine on board the luxurious R101 airship. April 1930: An aerial view of the Graf Zeppelin flying over Wembley Stadium in London during the 1930 FA Cup Final. The Graf Zeppelin over Jerusalem, 1931. A 1931 stereograph reads, "the Graf Zeppelin's rendezvous with the eternal desert and the more than 4,000 year old pyramids of Gizeh, Egypt." A 785-foot dirigible US Navy air cruiser, the USS Akron. The USS Akron was in its third year of flight when a violent storm sent it crashing tail-first into the Atlantic Ocean shortly after midnight on April 4, 1933, off the New Jersey coast. The disaster claimed 73 lives, more than twice as many as the crash of the Hindenburg, four years later. 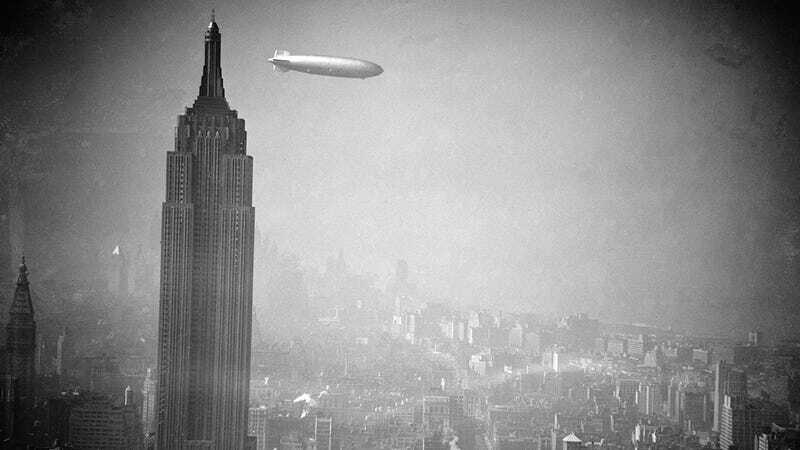 1937: The German-built airship "Hindenburg" (D-LZ-129) flies over Manhattan on May 6, 1937. A few hours later, the ship burst into flames in an attempt to land at Lakehurst, USA. 1937: The Hindenburg disaster at Lakehurst, New Jersey, which marked the end of the era of passenger-carrying airships. The Zeppelin caught fire and crashed, killing 36 people aboard. Top image: the Hindenburg floats past the Empire State Building in New York.